McKinney, Texas – Now in its tenth year, the McKinney ISD Holiday Bazaar has something for just about everyone on your shopping list. Packed with more than 100 area vendors, the bazaar is a highly anticipated annual shopping event that raises thousands of dollars that go to support MISD programs and organizations. Organized by the district’s Partners in Education department and sponsored by Texas Roadhouse, the bazaar attracts shoppers from all across McKinney and the surrounding area every year and features unique gift items, trendy clothing, arts and crafts, jewelry, home decor and collections for all seasons. Entry is free. Interest in the bazaar has grown each year with vendors staking their claim on retail space as early as July. According to Partners in Education Specialist Nancy Cowlishaw, who has organized the event since its inception, the bazaar brought in around $7000 last year for the district. Don’t miss this once a year shopping event! 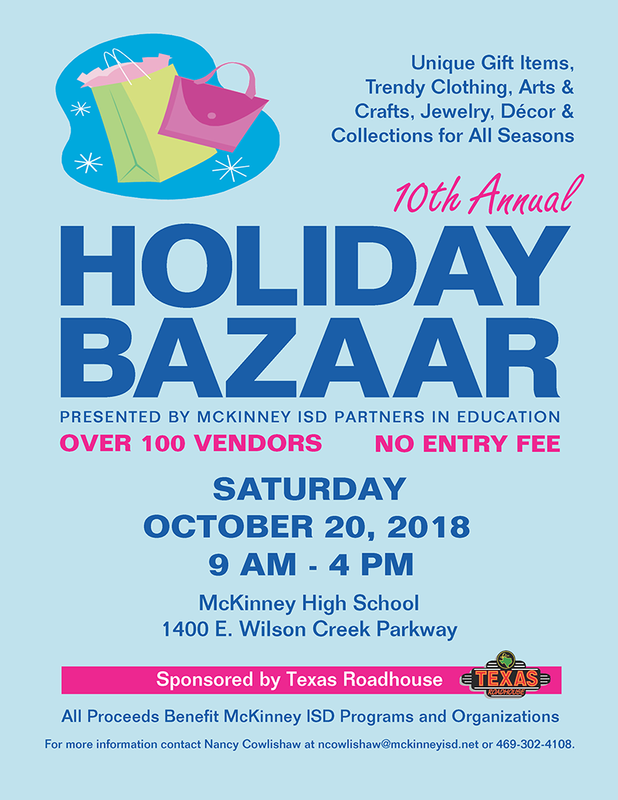 For more information about the MISD Holiday Bazaar, contact the Partners in Education office at 469-302-4108 or email Nancy Cowlishaw at ncowlishaw@mckinneyisd.net. The 10th Annual Holiday Bazaar is coming Oct. 20, 2018!